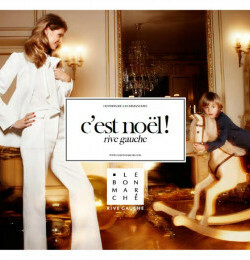 Le Bon Marche is the world famous department store in Paris, but now also has its own range of accessories. These include wedge sandals, sophisticated handbags, funky fashion rings and colourful shawls. The retailer was founded by Aristide Boucicaut in 1838. The son of a banker, he was born in Belleme, Orme on Bastille Day. He began his working life as a clerk before leaving to become a fabric salesman selling shawls. In 1829 he moved to Paris. It was in 1852 that Aristideï¿½s innovations in the distribution of Le Bon Marcheï¿½s of stock made their mark on the world of fashion. Three years later, the worldï¿½s Fair further inspired him to innovate and he introduced to his shop the notions of browsing, more developed advertising, fixed prices and catalogues. His wife Marguerite Guerin also played an important role in running the store. From its origins as a small shop in Paris in 1838, Le Bon Marche has grown to be one of the most well-known and much loved department stores the world has ever seen. In 1867 a new building was constructed for the store by Louis Auguste Bolieau. During the 1870s, his son, Louis Charles Boileau, continued working on the store, consulting the firm of Gustave Eiffel on parts of its structure. Louis Augusteï¿½s grandson, Louis-Hippolyte Boileau worked on an extension for the store in the 1920s.